Begin by chopping your potatoes. You want them to be as uniformly cut as possible. Add to a large pot. Add cold water to the pot until the potatoes are fully covered. Cover and bring to a boil. Once boiling, remove top and lower heat to a simmer. Cook until potatoes are done but still firm (about 15 minutes, but check periodically). Remove from heat, drain, and let cool. While waiting for the potatoes to cool, make the dressing. Add the mustard, Greek yogurt, cider vinegar, olive oil, and salmon with dill spice blend to a bowl and mix to combine. When completely cooled, add the potatoes to the bowl with the dressing, stirring carefully to coat evenly. 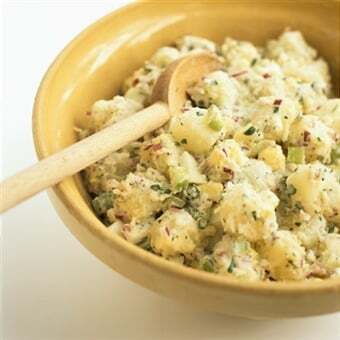 Potato salad is best when it has time for the flavors to meld. If possible, cover and refrigerate overnight. Sprinkle with fresh chopped parsley when ready to serve. *This post was brought to you by the makers of French’s Yellow Mustard. I received compensation to write this post through the French’s Naturally Amazing Program … all opinions expressed are my own. In your recipe for Tangy Mustard Tartar Salad the ingredients don’t call for salmon with spice blend. In the directions of make the Salad it calles for it. I don’t know what that is.